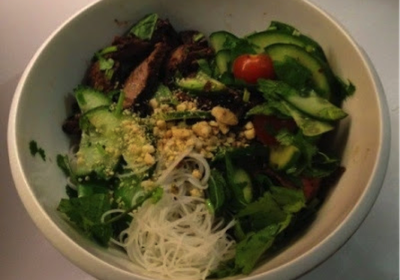 Last week we gave you 5 tips on how to eat out on low FODMAP diet. Today we investigate some go-to meals and tips for popular cuisines. Also, don’t forget to follow the tips from last week and most importantly, enjoy dining out! 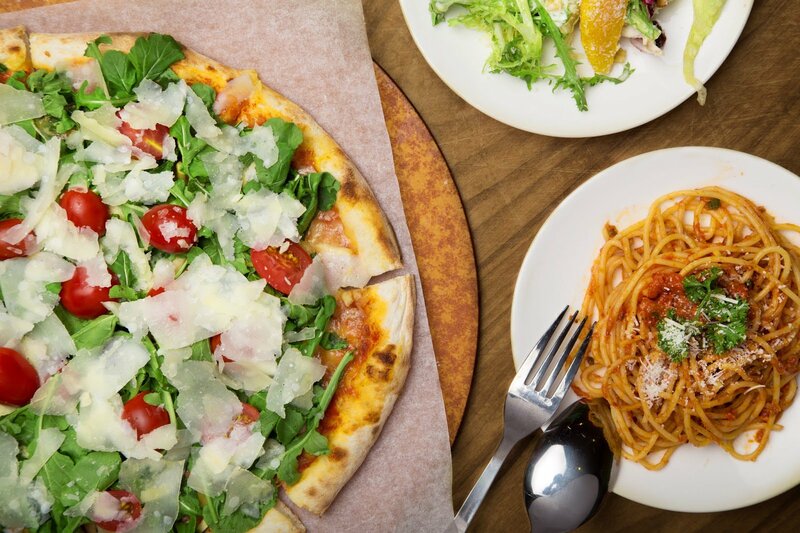 Gluten free pizza bases and pasta: Many Italian restaurants now offer gluten free products. There is no wheat in gluten free products, making them a good choice on a low FODMAP diet. Please note though, those with coeliac disease should always double check there is no gluten contamination from ovens and benches. Tomato passata: Check with wait staff if the tomato passata used on pizza bases and in tomato based pasta sauces is free from garlic and onion. Many traditional restaurants will just make the sauce using tomatoes and salt. Bianco bases: Some pizzas start with a bianco (white) base of just olive oil and garlic, if these are made to order the chefs may be able to leave off the garlic for a low FODMAP base! Choose hard cheeses if you are sensitive to lactose: the harder the cheese, the lower the lactose e.g. cheddar and parmesan. 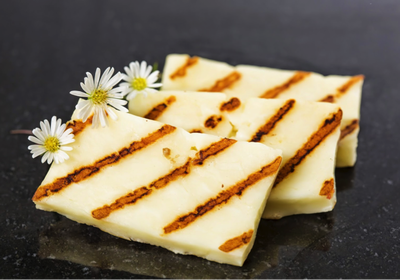 Some soft cheeses like haloumi and ricotta have a low FODMAP serve size, so check the app for quantities. Create your own: If you can choose your topping, choose low FODMAP foods e.g. capsicum, zucchini, tomatoes, olives…the list goes on! Be aware of risottos: these can be a good low FODMAP option as they are made from rice, not wheat, but it is important to check whether the stock used contains onion and/or garlic. Many different sauces are used in Chinese cooking. Ask the wait staff if any of these contain, onion, garlic or artificial sweeteners (polyols). If they do, ask for your meals to be made with only low FODMAP sauces, like soy or oyster. Spring onion is often used as a garnish, so ask for green parts only or just leave it off all together. A classic French dish of Steak Frites is steak served with chips, salad and often a sauce or mustard. Check if any of the sauces are onion or garlic free and if not, opt for a mustard and ask for the salad to be dressed with oil and vinegar. Salade Lyonnaise: This is a traditional French salad that contains lettuce, bacon, herbs, poached eggs and a mustard/vinegar dressing. Check with the waiters if it contains croutons and/or shallots (onions) and if these can be omitted. Nicoise salad: Similar to the Lyonnaise salad, this salad is made with tuna, olives, eggs, potato or rice and can be a good option. Just check for garlic and onion, croutons and also artichokes. Vegetarian and seafood based meals often don’t need as long marinating compared to red meats and poultries, meaning they could be prepared fresh and low FODMAP for you. Many Indian dishes contain curry paste bases, often made with shallots and other onion varieties. Call the restaurant ahead and see if they can prepare something especially for you or give you a few options to choose from. 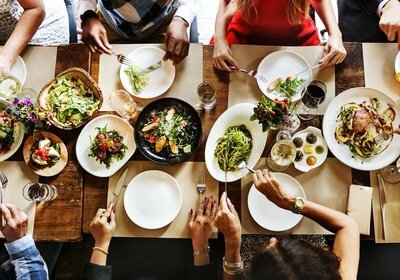 Remember, this is a LOW FODMAP diet, not a NO FODMAP diet, so try your best and remember to enjoy the eating out experience.